A-American Self Storage is ready to solve your storage problems. We offer superior options and our customer service is second to none! Find the facility nearest you to get started right away. Use one of our free trucks on your move-in. What makes us a step above the rest. A-American Self Storage is your solution! 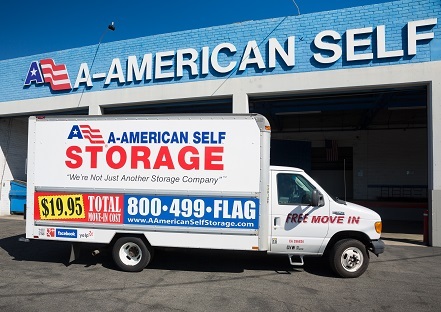 As one of the most solidly established storage companies in the U.S., A-American has the experience to ensure a hassle-free move into self storage. With storage facilities in California, Hawaii, Missouri, and Nevada, we are looked upon as industry leaders, and we take that very seriously. Although we're industry leaders, A-American remains a family company with strong roots in the communities it serves. Ever since our founder, Edmund C. Olson, opened the doors of our first storage facility, we've enjoyed welcoming new friends and neighbors. We take tremendous pride in our place in entrepreneurial history as one of the first self storage companies in the country. We have the right storage option for you! With so many different storage units available through A-American, there's no need to go anywhere else. Whether you're storing a few boxes or a house full of furniture, we have the perfect storage option to suit your needs. With over 45 years in the business, we know what's important to you. Let us take the stress out of your move! When you decide to move into one or more storage units at an A-American facility, we can arrange for free use of our moving truck. Yes, that's right, a FREE truck, including driver and insurance, is available. Our well-designed storage facilities make moving easy. In fact, you can expect that, once you're on the property, your self storage move-in will most likely take no more than 10 minutes. Modern facilities, quality units - we have you covered! Our place in self storage history doesn't make us stodgy and old fashioned. You'll find our storage facilities are modern and well kept, with state of the art security. We offer the best storage units for the best price. Plus, we offer you the best customer service - we hire only the friendliest, most helpful employees who strive to make your experience pleasant. Our flexible payment options make it simple to manage the financial end of your self storage experience. Our gate times are convenient and can, at times, be modified upon your special request. We keep all our storage units safe and sound with the latest in security and surveillance innovations. Come visit us, and we're sure you'll see why A-American should be your storage company!